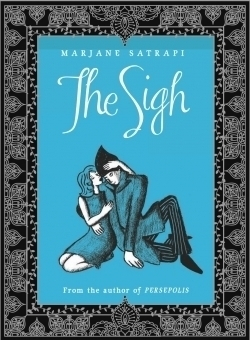 On the surface, Marjane Satrapi’s The Sigh is a simple fable, a momentary escape from reality into a world fueled by a child-like acceptance of both the mundane and fantastic. However, as with all the gifted cartoonist’s previous efforts, this slim volume offers discerning readers much more than a mere few moments of entertainment. The story’s main protagonist, Rose, is the youngest of a wealthy merchant’s three daughters. A widower, her loving and devoted father always returns from his extended buying junkets abroad bearing special gifts for his girls. And it is the nature-loving Rose’s unfulfilled wish for a blue bean seed, and her subsequent sigh of disappointment, that sets into motion the main action. For Rose’s disappointed exhalation summons the pointy-headed creature, Ah the Sigh, a sort of jinn who offers her father the longed-for legume. In exchange, the overjoyed merchant promises to return Ah’s kindness by offering to his benefactor whatever boon he might require of the doting father in the future, never suspecting that the jinn would reappear one year later to claim Rose as his prize. Bound by honor, Rose unhesitatingly offers to make good on her father’s promise. Blindfolded, Rose is spirited away to the Land of Sigh, a magical place where she is treated like a princess and spends her days luxuriating in all the wonders and rewards offered by this strange, enchanted land. When Rose discovers that she is being visited every night by a strange young man who turns out to be the Prince of Sigh, they fall in love and live happily ever after. Or that is how it might have gone in other, more prosaic hands. But Satrapi is not satisfied with the typical. Instead, her heroine makes a completely innocent—but utterly devastating—mistake that destroys their paradise, prompting her to embark upon a heroine’s journey in search of the means to right her inadvertent wrong, sending both herself and the tale down a circuitous path that leads eventually to salvation and a wholly satisfying conclusion. Ultimately, The Sigh is more than just the story of one young woman’s perseverance in the face of seemingly insurmountable obstacles and the worst of circumstances. It is also an exploration of the true power and incredible fortitude granted to those possessed of a selfless love and an abiding devotion—immutable, abiding truths Satrapi’s readers would do well to embrace wholly and with a full heart.